The book’s title refers to the vortex of conservative thought, identified by some as an echo chamber. that dominated much of official and unofficial discourse in the early part of last decade. Van Slyke and Clark spend some, but not a lot of time, exploring the definition and history of the very idea of progressive media, the various entities like Air America that have contributed along the way to the current state, and the galvanizing defeat in 2004 of John Kerry by George W. Bush. Readers of Matt Bai’s The Argument will recognize the first bloggers’ convention , held in Las Vegas in 2006 and spearheaded by the Daily Kos crew during this part of the book. The authors include examples throughout the book of the influence progressive media can have, whether through Jeremy Scahill writing about Blackwater, Brave New Films’ exposing Jerome Corsi’s mendacity about Obama, Joshua Michael Marshall’s bringing out Trent Lott’s wistful reminiscences about the good old days in the segregated South, or the online community mobilizing to push then presidential candidate Christopher Dodd into a more progressive position. Beyond the examples, though, the authors also insert a series of diagrams that articulates the different components of progressive media, ranging from established publications like MSNBC or the Nation, to key web sites to blogs to film companies like Brave New Films. 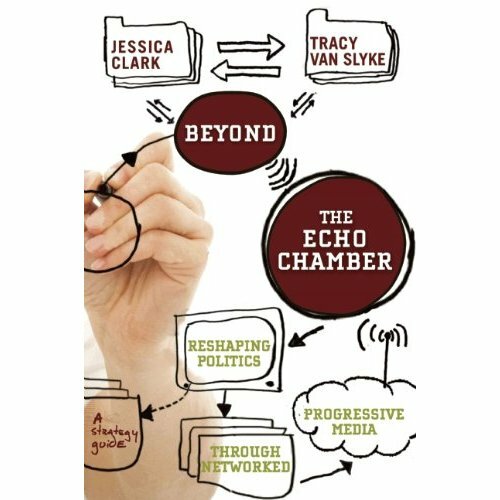 Part of Beyond the Echo Chamber’s value lies in how it shows how the different pieces of the puzzle can and should fit together. My only minor quibble with the images is that at times they convey a more clear and fixed reality than what actually exists, and my sense is that the authors would agree with this assertion. The book also has an intriguing exploration of the role of women in the blogosphere, finding them influential in individual cases, but a bit lacking on a systematic level, and a rousing call to move beyond the world of “male, pale and stale” that currently inhabits a disproportionately large chunk of attention, in their minds. Van Slyke and Clark brush aside Cass Sunstein’s objection, raised in Republic.com 2.0, that too much preaching to the choir is ultimately bad for democracy, arguing instead that the choir can be exactly the place to keep people engaged and work out passionate debates (I appreciated learning here about Victor Navasky’s tenure at The Nation, but did not find this section particularly convincing.). Then there’s the money. The authors acknowledge that doing high-quality investigative work like Scahill’s takes substantial time and resources, but don’t offer a lot of ideas about where to find it. This of course is part of the reason why journalism’s future as an industry is so uncertain and the interns mentioned above are seriously considering other careers. That these two dedicated women have not completely identified how to fix what thus far has been unsolvable to me only underscores the utility of this creative, timely and politically passionate work. This entry was posted in Current Books and tagged Beyond the Echo Chamber, Jessica Clark, progressive media, Tracy Van Slyke. Bookmark the permalink.